This article has had over 20,000 views. Thanks for reading it. Most Instagram photos are poor quality because they were taken with a smartphone. You can now take great-looking photos from a Wi-Fi-enabled camera and upload them directly to the Internet without using a laptop. I’ll describe how this is done using a Canon EOS 6D, but the process is similar with other Wi-Fi cameras. The Canon EOS 6D is pricey, but you don’t have to spend a lot of money on a camera to do the things I’m describing. Wi-Fi enabled cameras like this Samsung model start around $150. Canon has affordable Wi-Fi cameras as well. Start by downloading the free EOS Remote app from Google Play. After you’ve installed EOS Remote on your smartphone or tablet, you need to activate Wi-Fi on your camera and connect it to your mobile device. The next section describes how this is done. Press the Menu button on the EOS 6D and use the main dial to select the wrench icon with three dots next to it. Set Wi-Fi to ‘Enable’ and then move down to ‘Wi-Fi function’ and set a nickname for your camera (e.g. Canon 6D). Press the ‘Q’ button to tab down to the letters and the main dial to select them. Enter the desired name and press the ‘Menu’ button when you are finished. Press ‘Set/OK’ to proceed. Now move the main dial to the second position labeled ‘Connect to smartphone’ and press Set. 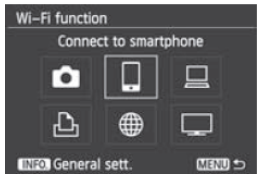 Then press ‘Set’ again to make the camera an access point and press ‘Set’ for OK.
Press ‘Set’ again for ‘Easy connection.’ Then press ‘Set’ for OK.
Now go to Settings > Wi-Fi on your tablet and select the nickname you entered for your camera. Now launch the EOS Remote software on your tablet and touch the name of your camera on the tablet display. Then press ‘Set’ on the camera twice to save your settings. This might seem like a lot of steps, but most of these only need to be performed once. After you’ve setup Wi-Fi, all you need to do is press the ‘Menu’ button and use the main dial to select ‘Wi-Fi function.’ Then you select ‘Connect to smartphone’ and ‘Connect.’ That’s it. If that choice isn’t available, first select ‘Exit’ and ‘OK’ and ‘Connect to smartphone’ will appear. Once your camera is connected to your mobile device, you can use your smartphone or tablet as a remote control and viewfinder. You can also view all of the photos on your camera on your tablet at full resolution. 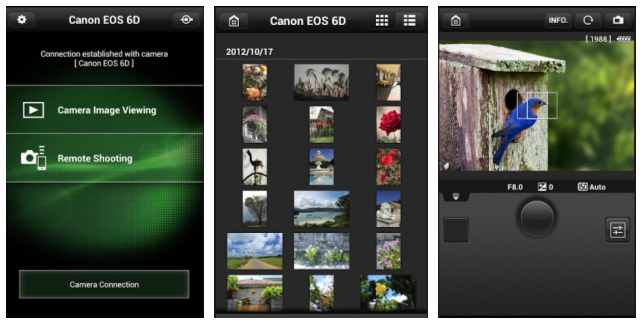 Touch ‘Camera Image Viewing’ in the EOS Remote app to view all of the images on your camera. Touch a photo to view it and swipe to the left to view the next image. Touch the trash can icon to delete a bad photo. Touch the icon on the far left to save your favorite photos to your smartphone or tablet. Keep in mind that these are reduced-quality images, so you should not delete the originals on your camera. After you’ve completed the preceding steps, you are now ready to upload a photo to Instagram (or another social media site). You’ll probably only need to read this section if you haven’t used Instagram before. After you’ve saved the photo you wish to upload, you need to go to Settings > Wi-Fi on your tablet and select the wireless access point you use to access the Internet. Then touch ‘Connect.’ Note: This step is not required if you’re using a smartphone. Touch the photo you wish to upload. Then touch the share icon near the top of the screen. If you don’t see Instagram, touch ‘See all’ and select Instagram from the list. Now crop your photo, add a filter and touch the icon in the upper right to save your changes. Now enter a description and hashtags for your photo and touch the green checkmark to upload it to Instagram. Follow me on Instagram @rickschwar . You can see higher-resolution pictures taken by the Canon 6D on Google+ as well. Please refer to the documentation that came with your camera to learn how to do these things. If you don’t already have a Wi-Fi-enabled camera, you should make sure your next camera has this feature. It’s nice to be able to upload great looking photos without using a computer. This article has had over 110,000 views! Although it was written for the Nexus 10, many of these tips apply to other Android tablets as well. Enjoy! Because my original Nexus 10 tips and tricks article was so incredibly popular, I’ve decided to write a follow-up. This time I’m including a few outside sources, however I assure you these tips will be every bit as good as the original ones and there will be no duplicates. – Turn off your tablet when you go to sleep and charge it all night. – Turn off your GPS when you don’t need it. To do this go to Settings > Location Access and set ‘Access to my location’ OFF. If you do this, any app which requires the GOS including Google Now will not function correctly. – Check the Sleep setting (under Display) and make sure it is set to 1 minute or less. Tether your tablet to your phone for free – As long as you have an Android smartphone, there’s no need to purchase a tablet with cellular support, or pay extra to use your phone as a Wi-Fi hotspot. Just download and install FoxFi on your phone and check ‘Activate WiFi Hotspot.’ Then go to Settings > Wi-Fi on your tablet, and connect to ‘FoxFi14.’ Now you’ll sharing data with your mobile phone. Make sure to keep tabs on the data usage shown in the upper right hand corner of the FoxFi app, and do not use this app if you sometimes come close to using all of your available mobile data. I cannot be held responsible for any extra data charges you incur because of the use of this app. Other caveats: The free version of FoxFi now has a usage limit that requires you to restart FoxFi at some point. You can purchase the full version key to unlock this. Currently WiFi mode does not work on most phones with Jelly Bean and most HTC phones (except for HTC One). However, Bluetooth mode works for all phones. 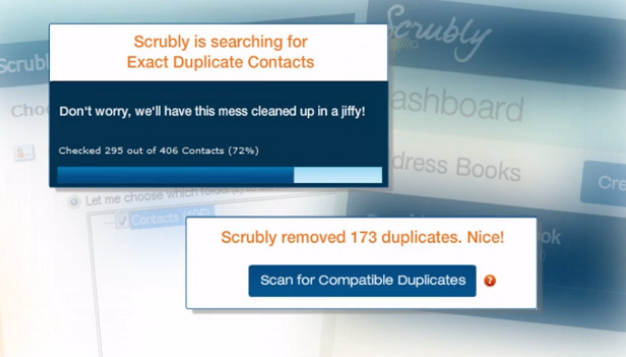 Clean up your contacts and add photos to them – If you have problems with duplicate contacts or contacts with missing info, you should go to Scrubly.com. Scrubly is a free service for people with less than 250 contacts. In addition to cleaning your contacts, Scrubly will import photos, birthdays, company, job title and more. Make sure to link Scrubly with your Facebook and LinkedIn accounts, so it can pull from those sources as well. I’ve used this service and was very impressed, but if you don’t like it, you can revert back to the way things were. Send SMS texts directly from your tablet – There are several different ways to send SMS texts from your Nexus 10, but one of the better ones is an app called Tablet Talk. This app uses Bluetooth to talk to your Android smartphone. This app is nice because the person you’re texting does not need to install any special software and all texts are sent using your mobile number. With Tablet Talk you can have a text conversation on your tablet just like you would on your phone. This is a paid app ($3) but I think it’s worth it. Install it on your tablet first and then connect to your Android phone via Bluetooth. Once you do that, you can download Tablet Talk on your Android phone for free. Tip: If you’re having problems connecting your Nexus 10 with your phone using Tablet Talk, make sure the Tablet Talk app is open on your phone first and then press the orange button in the lower-left hand corner of the Tablet Talk app on your Nexus 10. If you live in the U.S. and don’t want to mess around with Bluetooth, Google Voice allows you to easily send SMS texts as well and it’s free. The only negative is the fact that your texts will come from your Google number, and not your normal mobile number. Update: Mysms is now my favorite app for this purpose because it’s available in a tablet-optimized version for Android and can send texts to iOS devices, Windows phones, Macs, Chrome devices and Windows PCs. 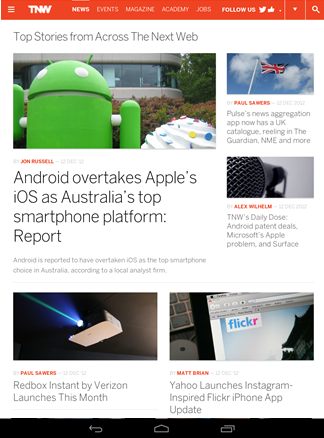 The tablet-optimized Android version is $2, while most other versions are free. Install an office app – At some point you’re going to need to open a file which was created with Microsoft Office. There are many apps that do this. 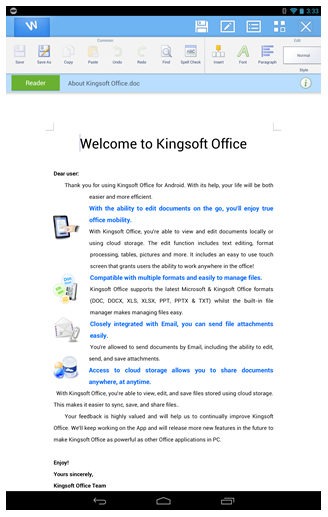 Consider Kingsoft Office (free), Quickoffice Pro HD, OfficeSuite Pro, Documents To Go or Google Drive (which replaced Google Docs). Most of these apps also create Word or Excel-style docs as well. Try another web browser – Chrome is good, but there are other good third-party browsers as well. Check out Firefox Browser for Android, Dolphin Browser, Opera (Mobile or Mini web browser), Puffin Web browser Free and xScore. Each have advantages over the others. You can read more about them in Google Play. Learn how to use your camera – Because there is no information about using the camera in the Nexus Guidebook, I’m adding some info here. You’ll find the ‘Camera’ app in the All Apps folder. Long press its icon and drag it to one of your home screens. To take a picture using the rear camera, press the big blue button. You’ll hear a sound which indicates you’ve taken a photo. To view the photo you’ve just taken, swipe to the left. Swipe back to the right to return to the camera. To switch to the front camera, press the circle to the right of the blue button. Then click on the camera icon with the arrows under it. In a few seconds you should see yourself on the view finder. The +/- controls are for exposure. To make a photo less bright press -1, -2 or -3. Next to that is the Settings button. From here you can access presets for things like action shots, night photos and sunset photos under ‘Scene mode.’ ‘Store location’ tags your photo with GPS info. Next to that are the white balance settings for different types of light. Next are the flash settings, To turn off the flash, touch the lightning bolt with an ‘x’ next to it. Press the Back button when you’re finished. To switch to the video camera, press the camera button to the left. 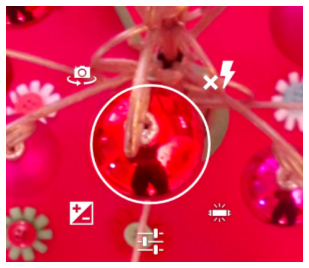 From top to bottom, the buttons are ‘Photo Sphere,’ Panorama, Video, and Still Camera. 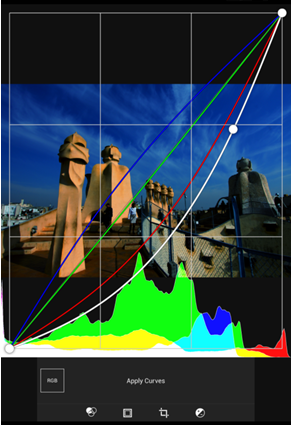 Here is the most comprehensive guide to using the Android 4.2 camera that I’ve seen so far. Get a stylus for more control – Although the Nexus 10 doesn’t have the same level of sensitivity of a Galaxy Note II, a stylus will give you more control and make it easier to take shorthand notes. Make sure to check out the reviews before you buy any stylus and never buy the cheapest one available, because you probably won’t be happy if you do. Transfer files quickly using Wi-Fi Direct – Wi-Fi Direct lets you send any type of file from your Nexus 10 to another Wi-Fi Direct device like a Samsung Galaxy S III. To send a photo or movie over Wi-Fi direct from your tablet to your phone, go to the ‘Photo Gallery’ app and select the file you wish to send. Then touch the item so the Share button appears. Next, select an app from the list which you know has Wi-Fi Direct support. I use the ‘OfficeSuite Wi-Fi Direct’ app. If you don’t have that, try Wi-Fi Shoot. Now, select the device you want to send your file to from the list of available devices. Photos only take a few seconds to transfer. Sending a 200MB movie took less than 5 minutes. Note: The receiving device may be sluggish while a file is being sent to it. On the sending end, you can swipe down on the Notification bar to see the transfer progress of the file. After the file transfer is complete, select the app on the receiving end that you want to view the file with. The file sent/received notifications cannot be cleared manually. They will go away after you restart your devices. Speak and translate – You may have seen the new Droid RAZR M commercial where the girl speaks into her phone and it speaks the words back in a different language. You can do that with your Nexus 10 as well. Just launch Google Translate. Touch the microphone icon, and speak the words you want translated. Touch the speaker next to the translated words to hear them back. 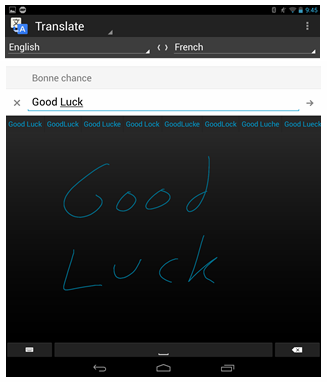 Scribble and translate – You can scribble on your tablet’s screen and Google Translate will translate the words into to any language. Try these tablet charging tips – For best results, power off your Nexus 10 and let it charge all night. If you do this, you should be able to get through an entire day of normal use without running out of power. On peak usage days, charge your tablet for an hour during lunch or early afternoon. Enable auto-fill on third-party browsers – Although Chrome has an ‘Autofill forms’ setting, there are other apps which give you more control over this. Install Dolphin Browser and the Autofill Form add-on for it. Lower your screen brightness even more – If you sometimes like to use the Nexus 10 in a room with all lights off, you may find that the screen is still too bright even when brightness is turned all of the way down. Apps like Screen Filter allow you to adjust the brightness of the screen as dark as you like. Beam something from your phone to tablet – If you have another Android device with NFC support like a Samsung Galaxy S III you can beam browser pages, YouTube videos, contacts and more from your phone to your tablet (or vice versa). Start by finding the media you want to beam and make sure both devices are unlocked. Next place your phone on the Nexus 10 as shown in the photo. In a few seconds you should feel each vibrate and hear a sound. Touch the screen after you see the image get smaller and the words ‘Touch to beam’ appear on the screen. If you’ve done it successfully, the image will continue to get smaller on the screen until it disappears. More info. In case you’re wondering where the two NFC sensors are on your Nexus 10. One is on the back to the right side of the camera near the top. The other one is by the front camera. Transfer files from your Mac to your tablet – If you’ve got a Mac, you’ll want to download and install the Android File Transfer app. Then plug your tablet into your Mac and the transfer app should automatically launch. Now can copy or move files by simply dragging and dropping them into the folders on the Nexus 10. Upload your music to the cloud – Since the Nexus 10 has a limited amount of internal storage and is not expandable, you should upload all of the music on your computer to the cloud. Google Music allows you to store up to 20,000 songs for free. Using the Google Music app, you’ll be able to access all of them as long as you have a Wi-Fi connection. To upload your music, download Google’s free Music Manager software to your computer. Control a DSLR with your tablet – DSLR Controller is a popular app that allows you to fully control your Canon EOS DSLR from your Nexus 10 with only a USB cable. Use your tablet to control, Live View, Image review, Auto Focus, Manual focus, Zoom control, HDR, Timelapse, Wi-Fi Passthrough, Shutter speed, Aperture, ISO speed, White balance and much more. It’s $8, so make sure your camera is on its supported device list before you buy. 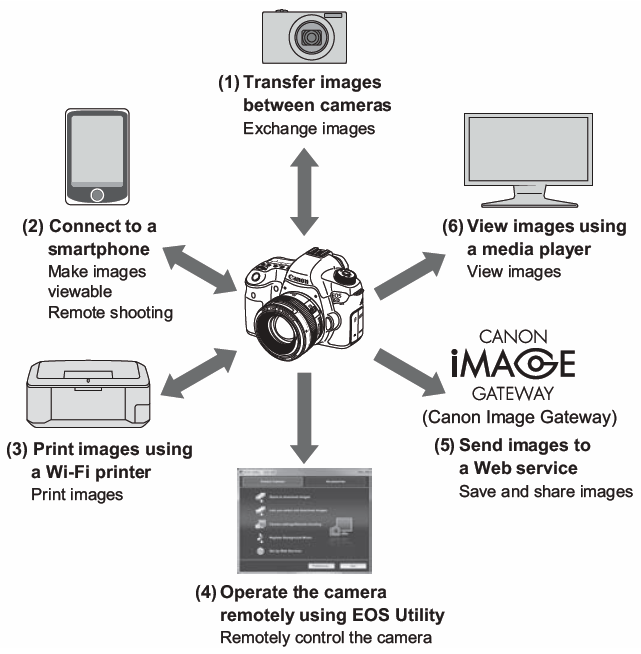 If you have a Canon camera like the 6D with Wi-Fi support, check out Canon CameraWindow and EOS Remote. Both of these apps are free. Upgrade your screen background and save battery life – Upgrade your screen background and save battery life – Most of the stock Wallpapers that come with your Nexus 10 tablet are not great. They use bright colors and do not take advantage of the full resolution of your display. Although you can download wallpaper apps, your best bet is to find some images you’ve taken with your DSLR camera or do an advanced search on Google Images. Enter a description in the first box, if you’re not sure what your looking for try “HD wallpapers”, “high resolution images” or ‘2560×1600 wallpaper’ in the first box. Select ‘Larger than 4 MP’ as the image size. If you want the best quality available, search for images above 12 MP. You’ll see a wide range of images to choose from. 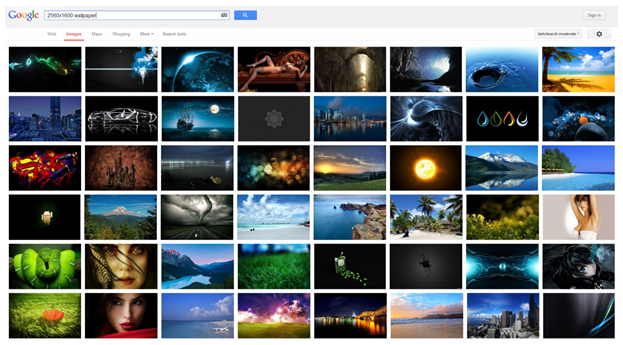 Click on a few that you like, and make sure to click ‘Full-size image’ on the right-hand side of the screen. You’ll find there are a lot of decoy images, which are smaller than they are supposed to be. If it doesn’t say 2560×1600 or larger under ‘Full-size image’ you should go back and select another image. 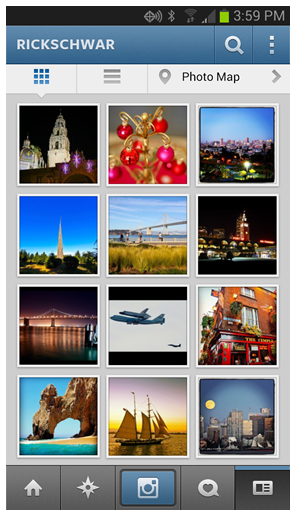 If can’t find anything good on Google Images, try Google+ Communities or Picasa Web Albums. 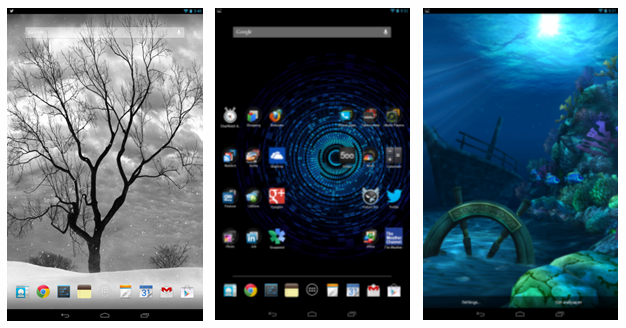 There are some good dark Nexus 10 backgrounds on this Google+ page. Now right-click on the large image and select ‘Save image as…’ Move all of your saved images into a folder called ‘New wallpapers’ and copy that into the ‘Pictures’ folder on your Nexus 10 using a USB cable. You could select your images from the Gallery, but you’d be asked to crop them and that would lower their resolution. Although the Nexus screen is 2560×1600, I’ve been told that the size of the wallpapers that Google includes with the Nexus 10 are 3966×2560. That’s because they pan when you change home screens. I use an app called ‘Simple Image Wallpaper Free’ which displays your wallpaper at its full resolution, doesn’t require cropping and doesn’t pan when you move to another home screen. If all this seems too hard, try a wallpaper app from Google Play like Wallbase, Interfacelift or Wallpaper Wizardii. Just make sure to select images which are 2560×1600 or higher, (3966×2560 is even better if possible). 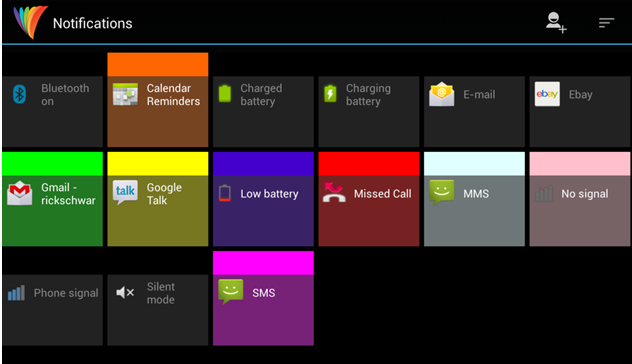 Install a better Live Wallpaper – All of the Live Wallpapers that come with the Nexus 10 are poor quality. You should install a good Live Wallpaper like Light Grid, Mystic Halo LW, Blue Skies Free, PanoPlanet, or Ocean HD ($1.99). My current favorite Live Wallpaper is Lonely Tree. It really shows off the Nexus 10’s screen with its 60fps motion and extreme detail. If you watch carefully, you’ll notice the clouds, tree branches, snow all move independently. Avoid most wallpapers in Google Play which claim to be HD. Most do not look good on the Nexus 10’s display. Once you’ve installed your new Wallpaper, go to Settings > Display > Wallpaper > Live Wallpapers and select the one you wish to use. Then touch Set Wallpaper and press the Back button to return to the Home screen. 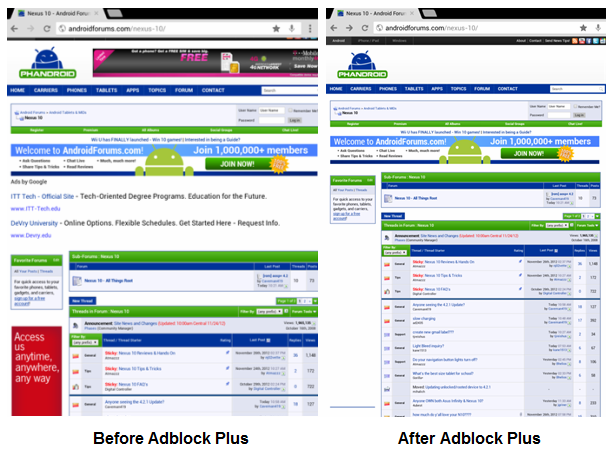 Bookmark some tablet-optimized websites – More websites are starting to update their layouts so they look great on the Nexus 10. 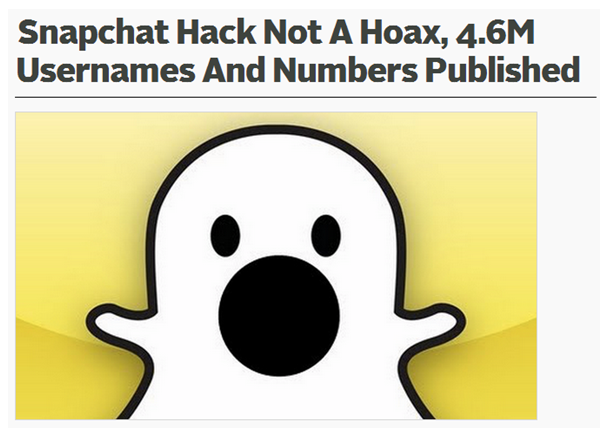 Checkout sites like Engadget, Google News, TNW (The Next Web) and BGR to see great examples of this. Maximize your screen’s contrast – Because the Nexus 10 uses a different screen technology than the Samsung Galaxy S III or iPad, you can’t set the brightness as high if you want the best contrast between black and white. I recommend that you set your screen brightness at 50% to 60% — unless you’re outside. Quickly review your photos and delete the bad ones – Within the Gallery app, touch where it says ‘Grid view’ to change to ‘Filmstrip view’. In this view, you can swipe right to move from photo to photo, or swipe down to delete any photo you don’t like. If you accidentally delete a photo, touch ‘Undo’ in the lower-right hand corner, but do this quickly because this option goes away after you go to the next photo. Expand your storage with an external Wi-Fi drive – Companies like Kingston have solid-state drives that add 32GB, 64GB or 128GB of additional storage to your tablet. These drives are small and communicate over Wi-Fi. Transfer files, photos or contact info using Bump – Bump is a free app which lets you transfer files wirelessly between any two devices (Android or iOS) — even if they don’t support NFC. 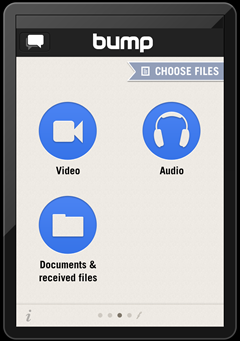 To use, open the ‘Bump’ app on both devices and select the file (or files you wish to transfer). Then tap the two devices together and press the blue Connect button on both of the devices. You can bump photos to your computer by going to http://bu.mp and bumping your spacebar with your device. Bump works with videos, docs, spreadsheets, presentations are more. Fix auto-brightness problems – Android 4.2 has an auto-brightness setting, but it doesn’t work very well. You should download Lux Auto Brightness to fix this problem. Lux automatically adjusts the brightness of your display based on your environment. When you go into a dark room, Lux will automatically lower the brightness of your display after you unlock your screen to make reading more enjoyable. To setup Lux you need to go through their setup wizard. I suggest you leave the factory default settings as is. After you do that, you’ll need to go back and launch the app again and touch ‘Press to enable Lux.’ Lux will adjust every time you unlock your screen. Although there is a dynamic setting, it doesn’t work as well, because it’s possible for your finger to occasionally block the light sensor when you hold the tablet in Portrait mode. If you sometimes use your tablet in a totally dark room, I suggest you go to the settings page and set ‘Night Mode’ alpha to 10. 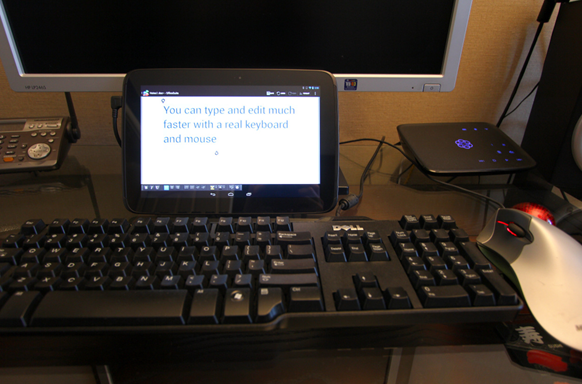 Get a Bluetooth keyboard – You can hook up a wired keyboard to the USB port on the Nexus 10, but a Bluetooth keyboard is much more convenient because its wireless. 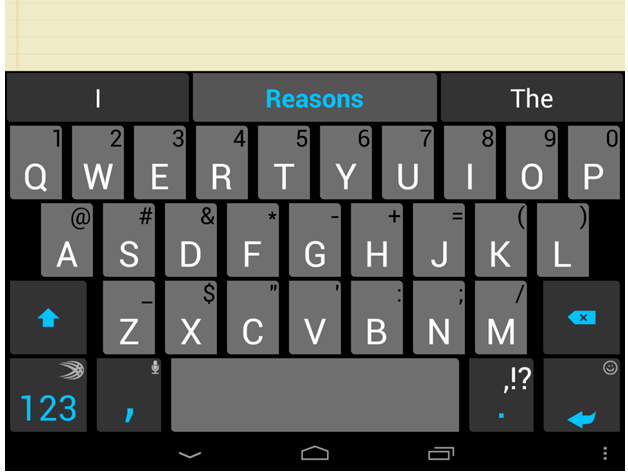 One of the best keyboards for the Nexus 10 is the Logitech keyboard for Android devices. It’s only $51 and is easy to setup. Just turn it on and press the Connect button on the button of the keyboard. Then go to Settings > Bluetooth on your tablet, touch Search for Devices, and select the Logitech keyboard. 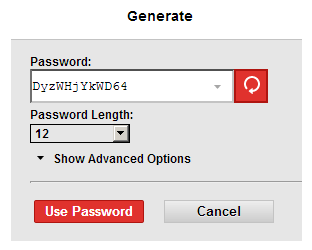 Next, type the number which appears on your tablet and press the Enter key to pair it. Now anytime the Bluetooth keyboard is on, you can type on it instead of your tablet. This keyboard comes with a carrying case which doubles as a tablet stand. 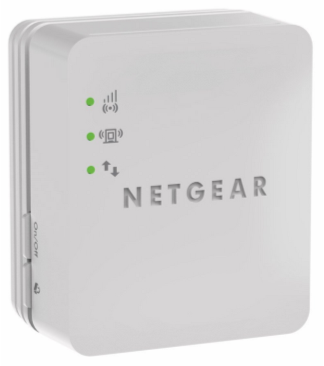 Improve your Wi-Fi signal strength – If you have a few spots in your residence where you’re not getting a strong Wi-Fi signal, you should consider purchasing a $40 Wi-Fi booster like this one. It’s easy to setup and designed for use with tablets. Just plug it in and wait for its LED to turn green. Then press the WPS button on the extender and your router and you should be ready to go. The new Wi-Fi network will be called the same as the old one, but end with “_EXT”. Make sure to select that network when you’re having signal strength issues. After connecting to a Wi-Fi Extender, I’m getting speeds that are almost 4 times faster than I was before. Create your own photo albums – You can use a file explorer app like ES File Explorer to make new photo albums inside of the Pictures folder. This is done by going to the Menu and selecting New and Folder. If you do this, your newly created albums will appear when you open the photo Gallery app. You can also delete any albums you don’t want by pressing Select and then touching the items you wish to delete. When you are finished touch the trash can. Get cut and paste to work every time – Several people have written to tell me they are having problems with cut and paste, so I thought I would try to help with this. To select a word, touch and hold on a word until the highlight and arrows pop up. When you do this on a text document, you’ll be presented with the following choices at the top of the screen: Select All, Copy, Cut and Paste. Drag the two blue region selection handles around the desired text and select Copy (or another one of the available commands). Then touch where you want to insert the copied text and hold until the word Paste appears. Press Done when you’re finished. If you do this on a Web page or most other screens, you’ll be presented with the following choices: Select All, Copy, Share, Search Web or Find. If the handles are orange and you don’t see Select All, Copy, Cut and Paste at the top of the screen, you should long-press the selection and Copy, Select All and Share will appear in a pop-up menu. Once you cut or copy the desired text, you’ll be able to paste it — after you long press where you want to insert it. If the paste option goes away, just touch one of the region selection handles again and it will reappear. Left your wallet at home? No problem. Use your tablet to buy lunch. 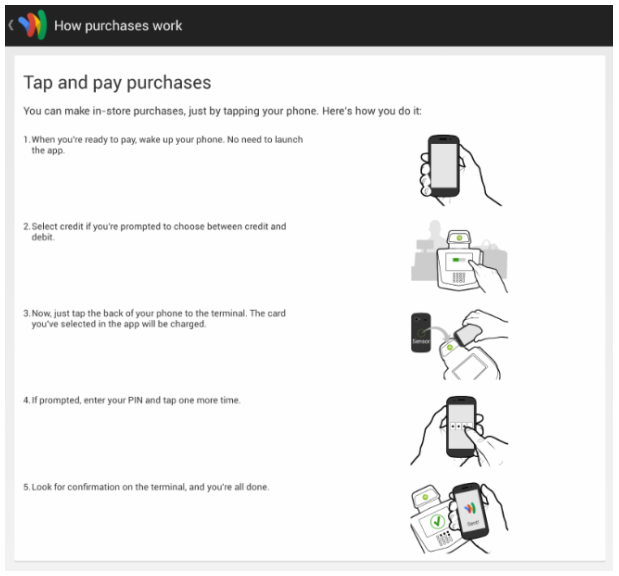 Use your tablet to buy things without a wallet – Since most U.S. carriers block Google Wallet on their smartphones, Nexus devices are the only way for most of us to use NFC to purchase things. Before you go to the store you need to run the Google Wallet app once to link it to your credit card and enter a PIN for security. You do not need to be connected to a Wi-Fi network in order to Tap and Pay. Just tap the back of your tablet near the camera on the cash register. You do need to be connected to setup a card or switch between default payment cards however. You can use Google Wallet in-store anywhere contactless payments are accepted, at over 300,000 merchants across the United States. Learn more about Google Wallet here. Use NFC to change settings – Another nice application for NFC is automatically changing settings when you move your tablet from one location to another. You can purchase low-cost sensor tags like these that can be placed anywhere and programmed to do many different things using an app like NFC Task Launcher. For example, when I set my tablet on my desk, it turns Bluetooth on so my keyboard works, changes Wi-Fi to a nearby 5GHz access point and turns up the system volume. When I go into to my bedroom, and touch my phone on the night stand it changes to my Wi-Fi extender network, and turns Bluetooth and system volume off. Stream music directly to your stereo speakers – Even though the speakers in the Nexus 10 are much better than other tablets, they are not as good as the ones that come with your stereo. By purchasing Belkin’s low-cost HD Bluetooth Music Receiver you can stream music wirelessly from your Nexus 10 (or the cloud) directly to your stereo up to 30 feet away. This works with Google’s Play Music app as well as other great free music services like Spotify, Songza and Pandora’s Internet radio app. Setup is made easier because it uses the Nexus 10’s NFC chip for “tap-and-play” pairing. I want this. Get 50GB of free cloud storage – You can never have too much storage. That’s why I use SkyDrive, Dropbox, Google Drive and MediaFire. MediaFire isn’t as flexible as the other storage lockers I mentioned above, but it’s the only one that gives you 50GB of FREE storage. You’ll need to first go to their website and create an account, then you can download the MediaFire app from Google Play. Changing your download directory – Several people have asked how they can change the default Download directory. You can do this with Dolphin Browser by going to Menu> More> Settings> Privacy & Personal Data> Download Directory. This article has received over 500,000 views! Although it was written for the Nexus 10, many of these tips apply to other Android tablets as well. Welcome to the most comprehensive list of tips and tricks for the Nexus 10 you’ll find anywhere on the Internet. This started off as part of a Nexus first impressions article, but quickly grew into a list of 50 tips, so I’ve broken it out on its own. Because this article is intended for everyone from beginners to experts, there will be some things here you already know here, but you’ll also find tips you won’t find anywhere else. Upgrade to the latest version of Android – There have been several updates to Android since the first Nexus 10 tablets left the factory. Make sure to install the newest Android system update. If your tablet isn’t already running Android 4.2.2, and it doesn’t appear under Settings > About tablet > System Updates, scroll to the bottom of this article to learn how to force an update to Android 4.2.2. 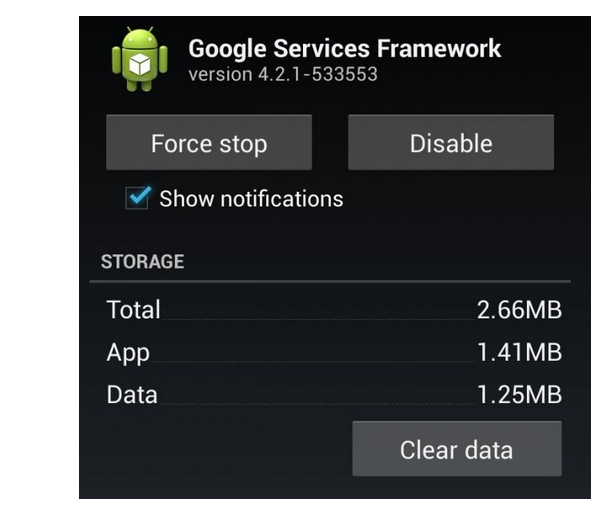 What’s new in Android 4.2.2? You can see a list of all changes here. Activate Google Now – Swipe up from the bottom of your tablet screen near the center to access Google Now. Before using Google Now you must go through a tutorial and then activate it. Then make sure location services are on. To do this you need to check the box next to ‘Wi-Fi & mobile network location’ and agree with the prompt. Then go through the settings for Google Now and enter your favorites sports teams and adjust a few other settings. When you’re finished Google Now will start presenting you with information tailored to your needs like the local weather. 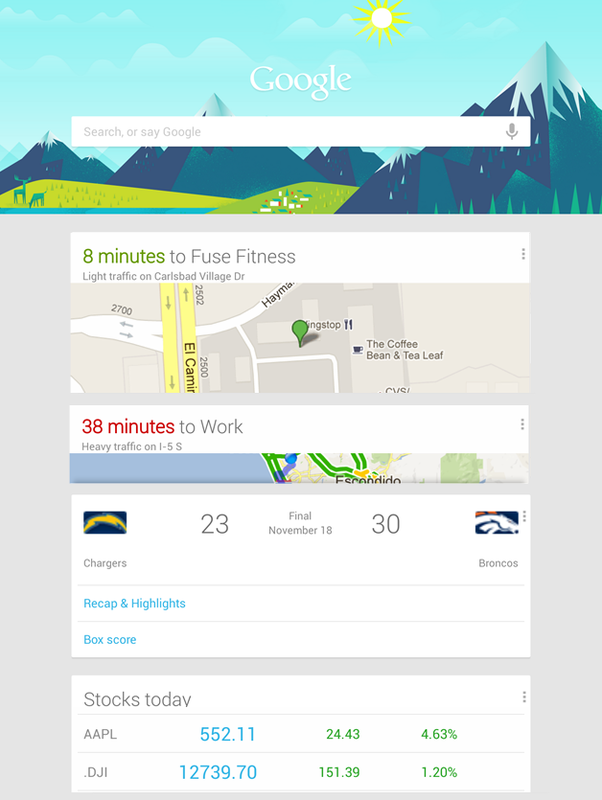 You can see what my first Google Now page looked like in the screenshot above. It’s worth mentioning I’ve never taken my tablet to the gym, or asked Google for my drive time to work. It provided that info based on my previous behavior. I know some people have privacy concerns, but I think this feature is great. 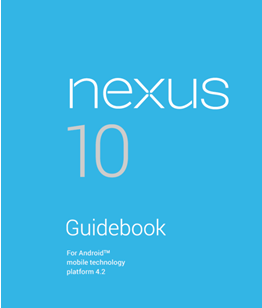 Download the official Nexus 10 Guidebook – Google just made available a new 159 page Nexus 10 Guidebook. You can download this excellent guide here. Once downloaded, I recommend you copy it to your tablet, so you can refer to it anywhere you go. Make sure you have a PDF reader on your Nexus 10 however. You can download Adobe Reader here. Download some tablet-optimized apps – You’ll quickly discover not all of your Android smartphone apps adapt well to the extremely high pixel density of the Nexus 10. For this reason, Google recommends you download some of the following apps: Autodesk Sketchbook Pro for Tablets, Cat in the Hat, Cut the Rope Experiments HD, Evernote, Expedia, Fandango Movies for Tablets, Friendcaster, Google Currents, Fancy, Heros Call HD Widgets, Hipmunk, Hulu Plus, Magic Piano, Mint.com, Netflix, News Republic for Tablets, Ocean HD, Office Suite Pro, OpenTable, Picsay Pro, Plume, Pinterest, Pulse News, SplashTop Remote Desktop HD, Strikefleet Omega, Sprinkle, SwiftyKey3 Tablet, Pocket, SeriesGuide, Taptu, TED, Trulio, Zappos and Zoomingo. In addition to the above apps, I would add the following apps which have all been optimized to run on tablets like the Nexus 10: 500px, AccuWeather for Android, AirCalc, Amazon Mobile (Tablet), BaconReader for Reddit, Business Calendar, Calendar, Ebay, Engadget, FIFA 2014, Flipboard, Google+, Google Pinin Input, Hotel Tonight, Kingsoft Office, NYTimes for Android, Pandora, PicsArt, Pinterest, Sing! Karaoke, Smart Tools, SkyDrive, Solid Explorer, Songza, SoundHound, Tasks, Temple Run 2, The Weather Channel, Twitter (tablet-optimized version), USA Today, Wunderlist 2 and Yahoo! Weather. Here’s a list of the top 150 Android apps. Many, but not all are tablet-optimized. Also, check out the Tablified Market app. It highlights apps that are designed and optimized for tablets. Install the Adobe Flash plug-in – Flash may be a dying format, but there are still millions of Flash videos around and the Nexus 10 should be able play some of them. To install Flash from the official Adobe website, follow the instructions at the bottom of this page. Note: Mostly-tech reader Craig has reported the above tip changed his default input language and broke voice and image responses via GoogleNow. If you experience either of those problems, switch back to the (US English) keyboard input setting. Control your tablet using your voice – Most people don’t know you can have your tablet open an app, create a calendar event, display a map, navigate to a place, send an email, set an alarm, define a word, show movie times, take a note, display a weather forecast, identify a zip code or area code, provide flight info, find a restaurant, run a calculator or provide a translation by simply speaking. Start by touching the microphone next to the search box. For more info, go to pages 58-64 in the Nexus 10 Guidebook (See Tip 3 to find out where to get this). There’s also a list of all 53 types of voice requests here. 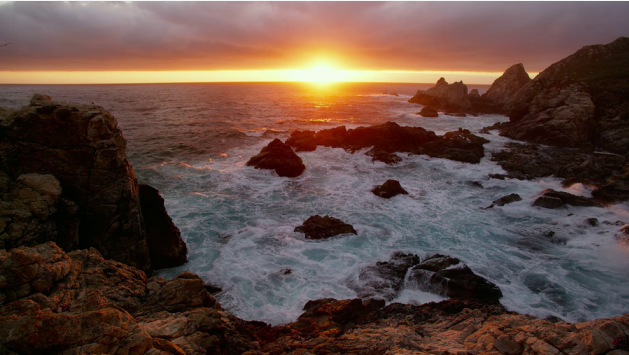 Download a high-quality video – If you really want to see what the Nexus 10 display is capable of when it comes to video, download Timescapes. It it the first 4K movie that you can purchase for $29.95. It has almost twice as many pixels as a normal high-definition video. If you’re not ready to shell out $30 bucks, but want to watch a free 1080p preview of the movie click here. If you decide to buy the movie, make sure to download the 2560×1440 version and not the others. The movie is over 6GB, so you should back it up to your computer, so you can free up space on your tablet if you need to later. In order to play this video, you may have to download free MoboPlayer software (or equivalent). Turn off haptic feedback if you don’t like it – When touch the screen on the Nexus 10 to navigate, you get a little vibration. If you don’t like this, go to Settings > Sound and uncheck ‘Vibrate on touch.’ Making this change will not turn off the vibration you get when you type on the onscreen keyboard. To turn that off, go to Settings > ‘Language and input.’ Then touch the Setting icon for the ‘Android keyboard’ and uncheck ‘Sound on keypress.’ Make sure ‘Vibrate on keypress’ is unchecked as well. If you’re using SwiftKey 3 Tablet, go to its settings page, touch Advanced. Touch ‘Audio and haptic feedback’ and uncheck Haptic feedback. 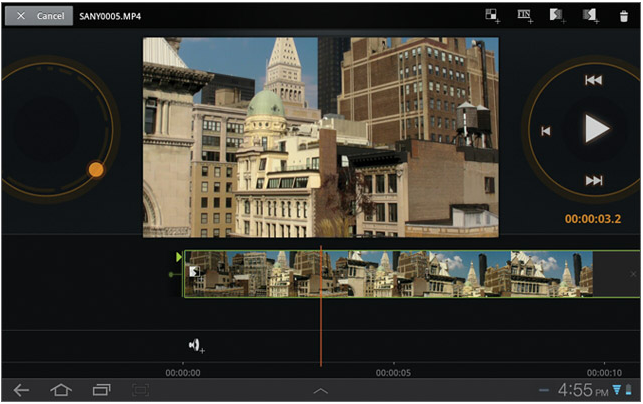 Shoot and edit video on your tablet – If this is your first Android tablet, you probably haven’t used ‘Movie Studio’ yet. Movie Studio lets you edit video clips together in a timeline with transitions, music, effects and titles. Movie studio has been around since Android 3.0, but the tablets back then didn’t have enough power to run it well. Here are some good instructions how to use Movie Studio. 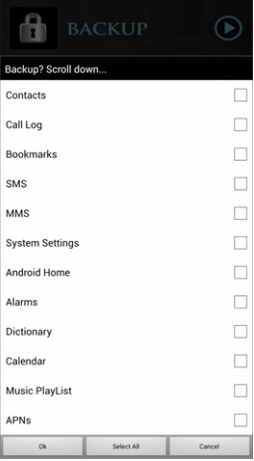 Unhide Developer Options – Earlier versions of Android had a ‘Developer options’ area in Settings but that’s no longer present in Android 4.2. However, you can still put your tablet into Developer Mode by going to Settings and touching ‘About tablet.’ Then click the build number seven times. After you do that you will see ‘Developers options’ appear in the Settings menu! This great tip came from Wai Ho Cheung. Try a tablet-optimized keyboard – If I had to pick one single app that softened my transition from the iPad 3 to the Nexus 10 the most it would be the SwiftKey 3 Tablet Keyboard. The reason for this is because I type a lot and I like to work in portrait mode. That squeezes the keys closer together and makes typing harder on the stock keyboard. I can’t say enough good things about this app. It takes a while for you to learn it, and for it to learn you, but when that happens, you’ll never go back. Toggle between MTP and PTP – Here’s another tip you won’t see anywhere else: You can put the Nexus 10 into Camera (PTP) mode by going to Settings > Storage and then selecting the menu in the upper right-hand corner. From there, you can select ‘USB computer connection,’ which allows you to toggle between MTP (which is the default) and PTP which lets you transfer photos using camera software. PTP also works on computers that don’t support MTP. Learn how to use Quick Settings – You can use the Quick Settings menu to turn on/off Wi-Fi, change screen brightness, turn off auto-rotate and more. To open Quick Settings, swipe down from the top right corner of any screen. You can even access the full settings menu from Quick Settings. Try the new Notification Shade – To open the Notification Shade, swipe down from the top left corner of any screen. You can do this even when your Nexus 10 is locked. Certain notifications like emails or calendar events can be expanded to show more information. Some notifications let you take action by touching icons. For example, Calendar notifications allow you to Snooze or send email to other guests. To collapse a notification, pinch it. To expand a notification, glide using two fingers. When you’re finished with a notification, just swipe it to the right to make it go away. To dismiss all notifications, touch the icon at the top right of the notification shade. If you long-press on an open task, you’ll be taken straight to the settings page for that app. Uninstall unneeded apps – After you’ve been using your tablet for a while you’ll probably have apps that you never use. You may want to remove any unused apps to free up space. The easiest way to uninstall an app is to press and hold the app icon in the app drawer and drag it to the top of the screen where it says ‘Uninstall.’ If it only shows App Info, it is a system app and cannot be uninstalled. However, if you drag the app to where it says App Info you’ll have the option to disable the app, which frees up memory. Download a new game – Playing games on your Nexus 10 tablet is very different than playing games on your smartphone. The large screen, killer graphics, faster processor and great sounding stereo speakers take gaming to a whole new level. 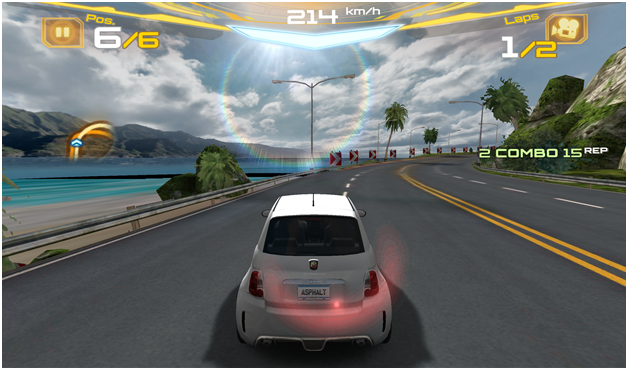 Make sure to download a game with great graphics like Asphalt 7, Dead Trigger, or Shadow Gun. All of these will cost you, but there are many great free games as well, including Temple Run 2. Improve your gaming graphics – If you’re a hard-core gamer, you probably already know what 4x anti-aliasing is. You can enable this on the Nexus 10 if you know a secret trick. First, enable Developer Options as described above in Tip #11. Then go to Settings and click on Developer Options. You will now see an option on the right to enable Force 4x MSAA. Multisample anti-aliasing (MSAA) is a technique used to improve image quality. Since the Nexus 10 has a GPU capable of supporting MSAA, this setting should make your graphics look more detailed when you’re playing advanced games. Keep in mind this will also cause your GPU to work harder and your tablet may get hotter and consume more power than normal. It’s also possible that all games may not support this, but this seems to work great with games like Asphalt 7. Source: Wai Ho Cheung. Use a gaming controller with your Nexus 10 – If you game a lot, you might try using a gaming controller with your Nexus 10. You have three options: If you own a Sony PS3, you can use up to four PS3 controllers with your Nexus 10 at the same time. Instructions here. You can also plug an Xbox gaming controller into the Nexus 10, as long as you have a micro USB to USB adapter. 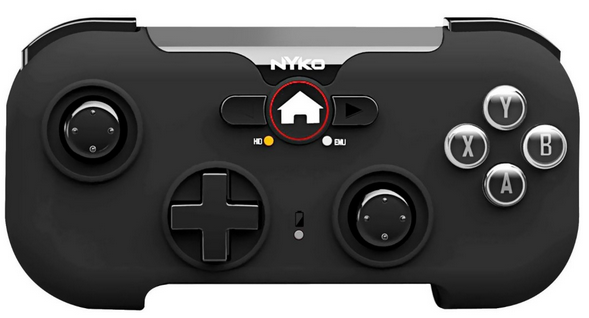 Lastly, you can purchase a wireless gaming controller like the Nyko Playpad. Copy your media to your tablet – One of Android’s best features is the ability to plug your charging cable into the USB jack on your computer and have your tablet appear as a hard drive. 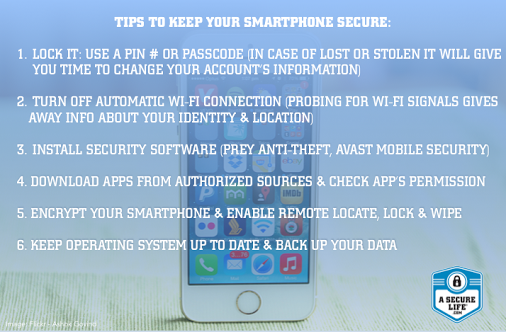 Once you do this, you can easily copy over the music, photos, videos or documents you want to take with you everywhere. Select a lock screen – If you plan to bring your Nexus 10 outside of your house, you should go to Settings/Security and pick a pattern (recommended), PIN or password-based screen unlock. It’s easy to connect a Nexus 10 to your TV and watch HD videos on it. Connect your tablet to a television – The Nexus 10 has a standard micro HDMI jack, so you can purchase a high-quality cable which connects to your TV for as little as $3. This allows you to watch high-definition videos from YouTube, Netflix or any other site on your TV. 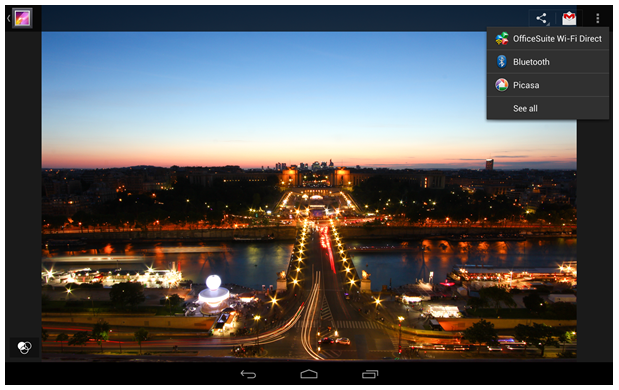 Unlike other tablets, the Nexus will display a video on your tablet and television at the same time. It will also automatically scale 2550x1440p videos to 1080p, so your television can display them. As you can see from the screenshot above, the picture quality is great. Important: Make sure to power down your tablet and television before connecting or disconnecting an HDMI cable. If you don’t, it’s possible that you could damage your tablet. Hook up an external keyboard and mouse – You can easily connect your tablet to an external keyboard, mouse, or other input device and use these just as you would with a PC. This can be done using Bluetooth or direct USB connection. To connect via USB you will need an adapter like this. To connect more than one USB device at a time, use a powered USB hub to reduce drain on your battery. I’ve tried a wired keyboard and a standard wired mouse with the Nexus 10 tablet and both work pretty well. The mouse had no issues whatsoever. The keyboard seemed to miss keys or spaces occasionally when I typed too fast. However, I really like using the arrow keys on the keyboard to precisely move the cursor around text on the screen. I also like the fact the tablet can tell there is a keyboard attached and does not display the onscreen keyboard. This saves a lot of space on the screen. External keyboard tips – In addition to entering text, you can use your keyboard to navigate your tablet’s features: Use the arrow keys to select items on screen. Press Return after selecting an item is equivalent to touching that item. Press Escape to go Back. Press Tab or Shift-Tab to move forward on a screen with multiple text fields. For maximum typing speed, turn off auto-replace, auto-capitalization and auto-punctuate. To do this, swipe down on the top of the screen and ‘Select keyboard layout.’ To do this, swipe down on the top of the screen and ‘Select keyboard layout.’ Don’t forget you can use keyboard commands like Ctrl-V to paste text just like you would with a PC. Expand your memory – One of the biggest complaints about the Nexus 10 is the fact it doesn’t have a memory expansion slot, but that doesn’t mean you can’t add your own memory by buying a short micro USB to USB cable and connecting a low-cost memory stick. However, stock Android devices do not automatically “mount” mass storage devices like USB sticks, so one additional step is required. If you’re Nexus tablet is rooted, the best solution is an app called Stickmount (Note: I was recently told there may be problems with it and Android 4.2, which the developer are working on now). Once StickMount is installed you connect a USB stick to your Nexus using a USB OTG cable and the device will show you a popup and ask if you want to open StickMount. You’ll need a file viewer app like ES File Explorer to display your files. More details. If your Nexus 10 is not rooted, you have two options: The first is a $3 app called Nexus Media Importer, which allows you to import or stream music, video, photos and documents from a USB flash drive or SD card. More info. The second option is free. You can enable PTP on your Nexus 10 by following the instructions in Tip #13 above. Once PTP is enabled, when you plug in a supported device it should immediately bring up the Gallery app with a new folder containing all of your photos. When you open that folder, you can either import, or browse the photos. All of the above options require a USB OTG to mini USB adapter. 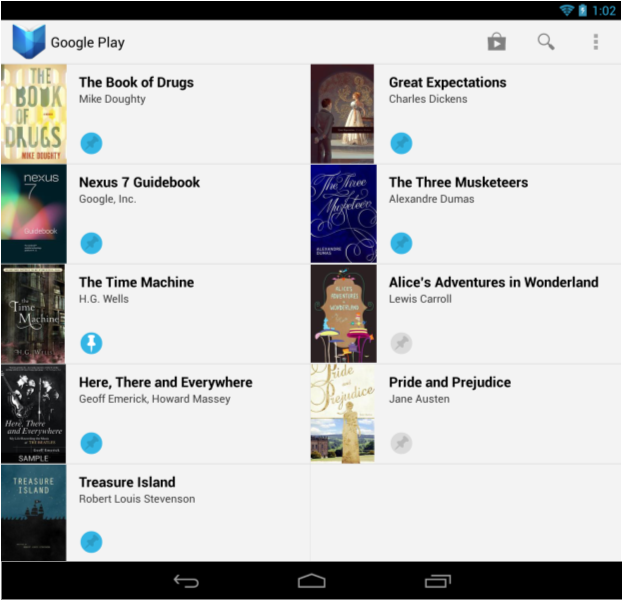 If you’re looking for more great tips and tricks for the Nexus 10, checkout this article. 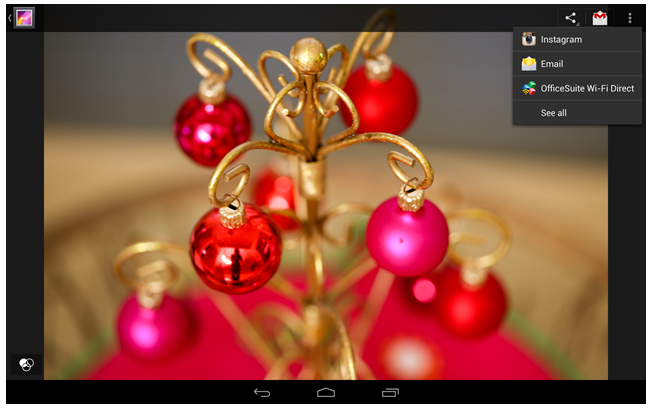 Edit your photos like a pro – The Android 4.2 Gallery app is more than just a photo viewer. It now has some serious editing capabilities. 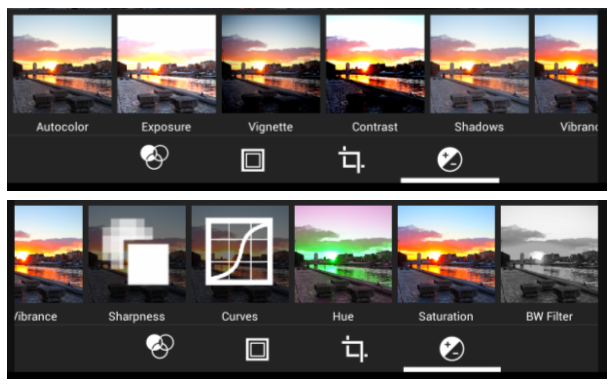 In addition to all of the standard Instagram-style filters, this app has some advanced photo editing features that are similar to the ones you’ll find in Adobe Photoshop Lightroom. The incredible screen on the Nexus 10 and fast processor, make it a serious photo editing station. For even better editing options, try Snapseed or Pixlr Express. Learn how to take a screenshot – To take a screenshot on the Nexus 10, press the power button and the volume down button and continue to hold them until you hear a beep and see the screen zoom in. The volume down is on the top part of the volume slider when you are holding the tablet in portrait-mode. Use the new Google Voice search – It doesn’t make sense to type your searches any more. Just touch the microphone near the top of the screen and talk, or say “Google” when you are on the Google Now page. Set up a guest profile – You may want to setup a guest profile on your Nexus 10, so a friend can check their email, and install their own games, but can’t update your Facebook status. Their app settings, screen background, game-progress and high-scores remain separate. To add a new user, go to Settings/Device/Users. Touch ‘Add user’ and then touch OK. Touch ‘Not now,’ if your guest is not available. A generic new user should now appear in the list. a. Make shortcuts on your home screens for all of your favorite apps. To do this go to the App locker and then touch and hold an app and drag it to the desired screen. b. Create folders for different categories of apps (e.g. Games, Utilities, etc.) and move all of the related apps into those folders.To create a new folders drag on app on top of another similar app. After the new folder is created, make sure to name it. c.	Uninstall any unnecessary apps or widgets from your existing homescreens. To do this, simply touch and drag them into the text ‘Remove’ near the top of the screen. 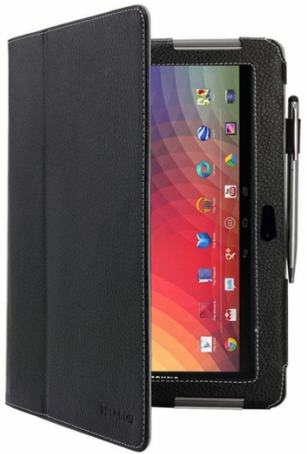 Buy a carrying case – It’s a good idea to purchase a leather case for your Nexus 10. This will protect your screen from scratches and give you additional protection if you drop it. Most cases also act as a stand for your tablet. Nexus 10 cases are just starting to appear on sites like Amazon.com. I just received this case and I’m happy with it. 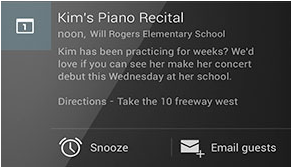 Don’t forget about the free music – Although you won’t see the free music that is included with your Nexus 10 in the “My Library” widget, if you go into ‘All Apps’ and open ‘Play Music,’ U.S. Nexus owners will find ten free songs from The Rolling Stones, Cat Power, M. Ward, The Lumineers, Bob Mould, Eskmo and more. Preloaded music in other countries varies. Install tracking software – You paid good money for your Nexus 10, so you don’t want to lose it. Make sure to install software like ‘Where’s My Droid‘ which allows you to track your tablet if lost or stolen. If you spend $4 to upgrade to the Pro version, you can also remotely lock your tablet, enable the camera to see the thief and as a last resort erase your tablet remotely. If you install this app, make sure to run the setup and connect the Commander screen to your Google account. Try gesture typing – The standard Android keyboard now allows you to slide your finger over the letters you want to type, and lift it after each word. You don’t need to worry about spaces, because they’re added automatically for you. This feature used to be only found in premium apps like Swype. Now you can use it whenever you like. Zoom two different ways – There are different ways to zoom in on the Nexus 10. The first is called double-tap. You can quickly tap two times on most webpages in Chrome to zoom in. Double-tap again to zoom out. This feature works on most webpages, maps, and other screens. Android 4.2 also has an interesting new feature called magnification gestures. When enabled, you can triple-tap the screen everywhere (except on the keyboard or notification bar) and zoom in. The nice thing is that you stay zoomed in, until you triple-tap a second time. To enable this feature, go to Settings > System > Accessibility and touch Magnification gestures. Then slide it from off to on and hit the back button. It’s worth mentioning that the way you zoom in works differently when you double or triple tap. Both have advantages, try each and see which is better for certain things. One user has reported that enabling triple-tap doesn’t work well when playing games like GTA3. Access your Google Play media offline – Normally Google Play streams your content from the cloud when you access it. This is done so the content doesn’t take up any of your precious storage space. However, there are times where you may not have access to the Internet, but still want to read a book or watch a movie. To do that you’ll want to download or ‘pin’ the media on your device so you can access it offline. To ‘pin’ a book, open the Play Books app, go to the menu and select ‘Make available offline.’ A blue dot with a pin in it means the book is available for offline, but has not been downloaded yet. To download it, tap it once and the pin should turn white. Once the book is finished downloading, the pin icon should be upright, white and surrounded by a blue dot (like “The Time Machine” book above). Keep in mind that downloading a movie will consume a substantial amount of storage space (~1.7GB). Quickly change camera settings – You can now press and hold on the camera app screen and swipe to quickly change white balance, HDR and other camera settings. You can also go directly from the camera app to the Photo Gallery app by swiping to the right. Swipe left to return to the camera. Improve your Internet download speeds – If you have Wi-Fi range issues like I do, you may want to purchase an Ethernet adapter. The Nexus 10 supports USB-OTG, which makes this possible. Although micro USB to Ethernet adapters are available, they don’t get good reviews, so you’re probably better of with a USB to Ethernet adapter like this and a micro USB to USB adapter. More about the types of things you can connect with USB-OTG. Pinch-to-zoom Gmail – Gmail has a new setting called ‘Auto-fit messages’ which is not enabled by default. When you enable this setting, you can manually pinch to zoom in or out on an e-mail. This is really useful. Customize your LED notifications – A free app called Light Flow Lite allows you to take control of the colors of your notification LED. It also makes your Nexus 10 flash one color after another. This app allows you to set the notification color for the over 250 applications and system events including missed calls, low battery, no signal, voice mail, calendar reminders, Gmail messages, email messages, SMS messages, MMS messages, Twitter notifications and more. Quickly silence or restart your tablet – To quickly silence your Nexus 10, press and hold the power button for 1-2 seconds. To restart your tablet, press and hold the power button for 8 seconds. Make it easy for someone to return your tablet if lost – It’s a good idea to add a message to your lock-screen like the following: If found, please call [Enter your area code and phone number here]. To do this, go to Settings > Security > and touch ‘Owner info’ (or User Info, for other users). Then enter the text you want displayed on the lock screen. Backup everything on your tablet – Although it’s true Google backs up some of your data, it doesn’t back up everything. My Backup Pro backs-up your photos, SMS texts, contacts, call log, browser bookmarks, system settings, Home screens, music playlists and apps. Your entire backup is stored online. Use your tablet as a phone – You can turn your Android tablet into a phone with apps like Talkatone, GrooVe IP, Viber, Tablet Calling or others. A free Google Voice account is required by most of these programs. For best results, you’ll want to use a Bluetooth earpiece, since the mic used for this is located on the back of your tablet. For video calls try Skype or Tango. Video calls use the front camera on the Nexus, which works pretty well, however you still should use a Bluetooth earpiece for best results. Let Google know where you live and work – In order to get the most out of Google Now you must enter your home and work addresses. To do this go to maps.google.com using your browser, touch the Menu icon in the upper right hand corner, and open My Places. From there, you can enter your home and work addresses. Nexus 10 features to avoid – Because Android 4.2 and the Nexus 10 are still so new, there are several features you may want to avoid until the next update is available. Avoid using Lock-screen music widgets and Auto-brightness. If auto-brightness is important to you, please refer to Tip 40 here for a work-around. Get yourself some wireless headphones – The Nexus 10 is great for multimedia. 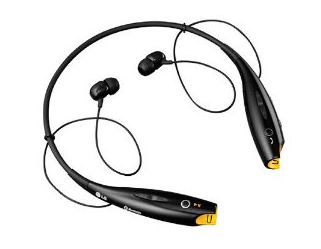 After Google fixes the Bluetooth issues with Android 4.2.2 you may want to get yourself a wireless headset like this one. It’s stereo, sounds good and also has a mic, so you can make calls with it. If you have problems pairing your Bluetooth headset, try it several times. It took me at least three tries before it worked. Get help from Google – You can call (855) 836-3987 and ask Google questions about your Nexus 10 24/7. I know some people are bashing Google for their phone support, but my phone support experience was positive. Once I waited on hold for 15 minutes, but the person who answered my call was able to quickly solve a difficult problem. Visit the Nexus 10 support site online for more information. Hopefully you’ve learned something new after reading this. 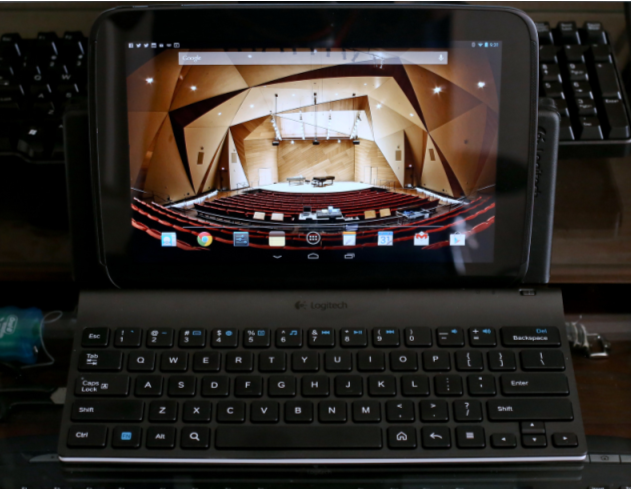 If you’re looking for more great tips and tricks for the Nexus 10, check out my next article. Go to Settings > Security > and check “Unknown sources” under Device Administration. Go to Google Play and download Firefox (or another browser that you are sure has Flash support). Next, download Flash from the Adobe website by clicking here. Drag the downloaded file labeled ‘install_flash_player_ics.apk’ into the ‘Download’ folder on your Nexus 10. Now use an app like ES File Explorer to locate the APK in your Download folder and touch it. Next, touch ‘Install’ and ‘Agree’ to install the Flash plug-in. Note: Although I have not experienced any problems with Flash on the Nexus 10, I can not be responsible for the results of the actions you are about to take. You are installing software which is not officially supported, and could result in security or stability issues. I wouldn’t be too concerned however. I’ve been running this for more than four weeks now and have visited many sites. Content on most sites plays fine for me. Nothing bad has happened on the other sites. To test that Flash is working, go to this page (or any other page you know has Flash on it). If you don’t see a video, touch where it says ‘Tap here to activate plugin’. After you do this, you should see a red box jumping around on the screen. I’ve noticed that most, but not all Flash files play on the Nexus 10. 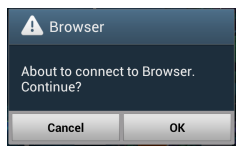 This appears to be due to an incompatibility between Flash and Android 4.2. If Flash videos don’t play the first time, don’t try to activate Flash on that page again. Enjoy! Although it’s not essential, if you don’t plan to sideload more APK files, you should go back to Settings > Security > and uncheck “Unknown sources” under Device Administration. Can’t get Flash to work? Try some of these suggestions. Go to Settings > Apps > and swipe the area which says “DOWNLOADED” to the right until you see “ALL” tab under Apps. The screens below were borrowed from a Cult of Android article for another device. Your screens may look slightly different. Now, scroll down to where it says “About tablet” and touch “System updates’ and touch the “Check now” button. If it does not find the 4.2.2. update, restart your tablet and try again. If the above steps do not work, repeat them rebooting your device after step 3. You may also need to repeat the steps twice for the update to show up on your device. This approach worked for me, but may not work in all regions. After I forced an update to Android 4.2.2 I could not download or update apps without an error. You have have that problem, you may want to do what I did to fix it. Go to Settings > Apps > and swipe the area which says “DOWNLOADED” to the right until you see “ALL” tab under Apps. Select “Google Play Store”, and then tap “Clear cache” and “Clear data.” Please note: After clearing the Google Play Store app data, if you have set a PIN code and/or a content filter, you’ll need to re-apply these settings. Try it again. If you still cannot download apps, try removing and then re-adding your Google account on the Settings screen. This worked for me. This article has had almost 190,000 views! Thanks for reading it. Although this article refers to the Galaxy S III, S Beam also works with current Samsung mobile products. By now you’ve probably seen the Samsung TV commercial where the wife sends a video to her husband by simply touching phones. Both Google and Samsung refer to this process as beaming. Beaming multimedia is very cool, but it’s not new. I helped create patent-pending software back in 2009 that sent music, photos or video from a web browser to a connected TV, stereo, game console or mobile phone. That was the first software that used the term “beam” to describe the wireless transmission of multimedia from a computer to a connected device, but readers have pointed out that Palm Pilots were beaming contacts, notes, to-do items and calendar entries more than a decade ago. Beaming of multimedia from one phone to another has been possible for over a year using this and other apps, but few knew this was possible before Samsung started running their commercials for the Galaxy S III. The technology which makes beaming possible is called NFC, which stands for Near Field Communication. NFC has been available on Android devices for almost two years. You can learn more about NFC and its many uses here. The technology used to beam the music playlist in Samsung’s TV commercial is called S Beam. It uses NFC and Wi-Fi Direct and has been available since May. 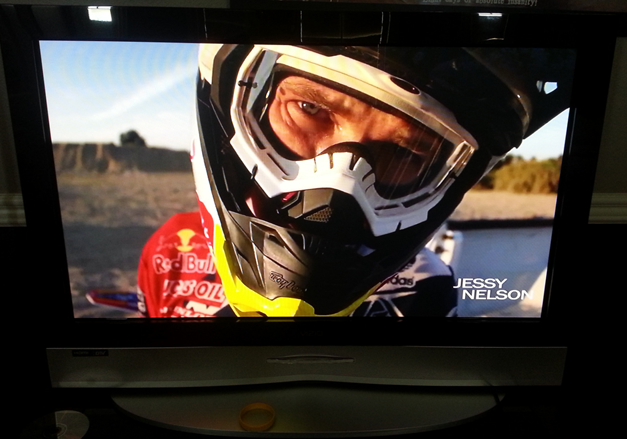 The Samsung commercial makes beaming look easy. Google claims Android Beam lets users share with a single tap. Is it really this easy? No. Beaming only works after both mobile devices have been setup properly. 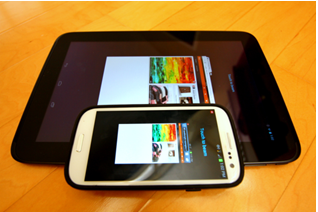 Before I wrote this article, I couldn’t even get beaming to work between my Samsung Galaxy S III and a Nexus 7 tablet. But once I setup both devices properly and learned a few tricks, beaming now works almost 100% of the time. This article will teach you how to beam like a pro. The section will teach you how to setup your devices and use Android Beam. In order to beam items from one phone to another, you need two Android devices that have NFC support. Here’s a list of all of the phones with NFC support. Before trying to beam you must go to Settings/More Settings and make sure NFC is checked and Android Beam is enabled on both devices. Now you’re ready to beam, but before you can do so, you need to open the app you wish to beam from. A list of supported apps is displayed later in this article. Next, you need to locate the item you want to beam. You can beam web pages, contacts, maps, YouTube videos and much more. Finally, you need to hold the backs of your two mobile devices together until you hear a chiming sound. If this doesn’t happen in a few seconds, move your devices apart and then back together. Troubleshooting Tips: Beaming won’t work unless the screen on the destination device is unlocked. You do not need to tap the two devices together, but they do need to be very close. When beaming from a phone to a tablet, you may need to move your phone around on the back of the tablet to find the spot where the NFC module is located. After you hear the chime, you need to quickly touch the item you want to beam. If you do this correctly, you’ll see the screen shrink and hear a two-tone confirmation sound. If you press too long, you’ll hear a fast four-part tone that goes from high to low and you’ll need to beam again. If you wait to touch the screen until after the image grows back, you need to move the two devices apart and beam again. If you touch outside of the shrunken item, it won’t beam. 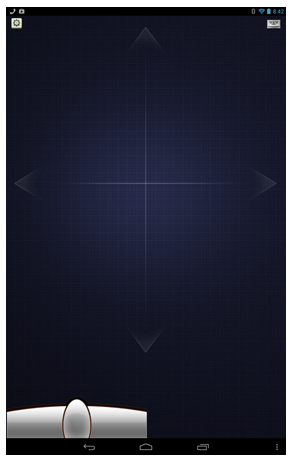 After performing all of the steps above, the beamed item should appear on the other devices’ screen. Although this may seem like a lot of steps to follow, once you get the hang of it, it’s pretty easy and you’ll want to beam all of the time. Want to beam a music playlist like you see in the Samsung commercial? What about a photo or video that you took with the camera on your phone? You can’t do that with Android Beam (running on Android 4.0-powered devices). Fortunately, there are several solutions to these problems. Use S Beam on Two Galaxy S IIIs — NFC is great for transferring things like contacts or URLs that point to maps or YouTube videos, but it’s not ideal for large files like videos. 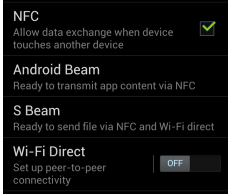 That’s why S Beam uses NFC for device pairing and Wi-Fi Direct for high-speed data transfer. Wi-Fi Direct is capable of data speeds around 250 Mbps, but because the Galaxy S III supports Wi-Fi channel bonding, files can be transferred at speeds up to 300Mbps. Of course your mileage may vary, depending on the distance from your wireless access point and the amount of interference in your area. You can see S Beam in action here. Real world speeds are good, but not amazing. The actual transfer time for a photo is 1 to 2 seconds, but it takes an additional 4 to 6 seconds to establish a connection using S Beam. Another thing to be aware of: When you touch the back of a Galaxy S III to another S Beam-enabled device for the first time, it takes about 10 seconds to make the connection. For security, the connection times out after 10 minutes. Use Android Beam on Two Mobile Devices Running Jelly Bean — Android Beam now allows you to send photos and videos from one device running Android 4.1 (Jelly Bean) to another. Just select a photo or video in the Gallery app, and then hold any two NFC-enabled devices back to back. When prompted, tap the screen to send the file as described above. File are now send using Bluetooth, so transfer speeds are faster than earlier. However files transfers are not as fast as S Beam — because Bluetooth is only capable of data transfer speeds up to 24 Mbit/s. Performance isn’t too bad. It takes about 7 to 9 seconds to send a photo, and 15 seconds to send a short video. After you beam a photo from the Gallery app, you’ll see the photo downloading in the Notification bar. After the download is complete, you have to swipe down, and select the photo you wish to view. Beamed videos automatically appear after the download is complete however and are ready to play. Cool observation: Bluetooth does not need to be enabled before you beam a photo. Android Beam will automatically turn Bluetooth on and off as needed. This should reduce battery usage. Most people don’t know Android Beam can now send multiple files from one Android 4.1 device to another. To do this, long press on a photo or video in the Gallery, select the items you want to transfer, and then hold the devices back-to-back to start the beaming process. Because Bluetooth is being used, you should avoid trying to send too many files at once. Which Apps Work and Which Ones Don’t? Here is a list of apps that work with Android Beam followed by any issues they may have. Contacts (Android 4.0) – This app seems to be a little temperamental. Wait until the screen gets small before you tap it. This takes about four seconds. Then tap near the photo area. 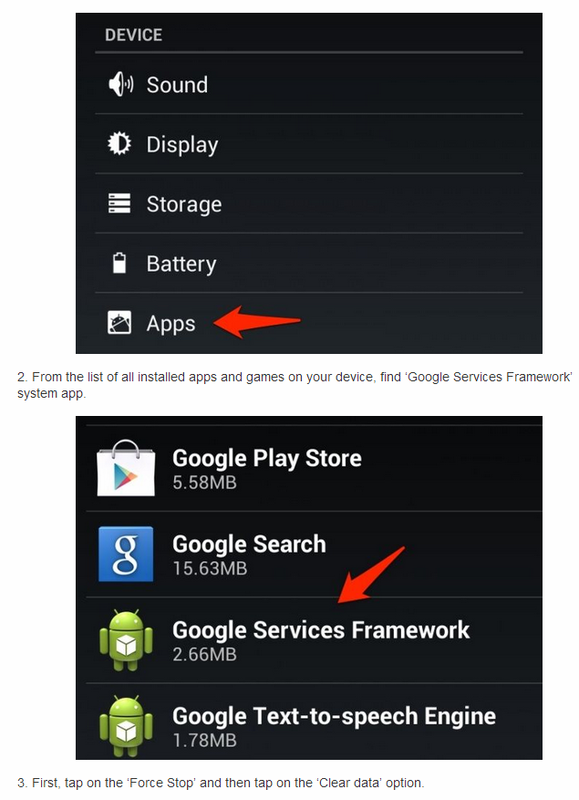 Google Play – Android Beam pushes a link to the app’s details page in Google Play. On the other device, Google Play launches and loads the details page, for easy downloading of the app. YouTube – Can’t beam ads, skip any ads before beaming. This is a partial list of the apps which work with Android Beam. As I find more apps that work, I’ll add them here. Very safe because NFC only works at distances of 4cm or less. Safe when good Wi-Fi security practices are followed. S Beam isn’t the only game in town. I’ve been using an app called Bump for years. It started as a way to exchange contacts on iOS devices, but now can transfer any file you have on your device (videos, documents, spreadsheets, presentations, etc). First install the Bump app on both of your devices. Next, launch the app on both devices and select the type of file you want to exchange. Then touch your devices together lightly until you feel them vibrate. You need to press the blue Connect button on both devices, before your file can be transferred. Like Android Beam, Bump can be a little temperamental and often requires several tries before it works. Also be aware that all music metadata and album art is lost when you transfer music files. In theory, you should be able to tap an NFC-enabled Windows Phone 8 to a Galaxy S III or Galaxy Nexus and share anything. 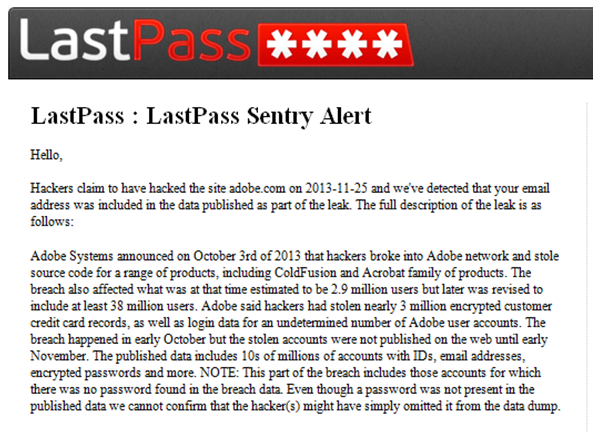 However, I’m told that sharing of web pages and contacts work fine, but sharing of files and photos does not. Let’s hope Microsoft and Google get together to address this issue soon. While it’s true that Samsung and Google may have oversold beaming, once you know how to use it, it’s a powerful feature. As more devices support these two features, I’d like to see both companies enable these by default so no setup is required. Also, Samsung should find a way to automatically toggle on and off Wi- Fi Direct (like Google does with Bluetooth beaming), so you don’t have to turn it on every time. I’m glad that Samsung has made this concept something that everyone now is aware of. We live in a wireless world, and you should never have to connect a cable to transfer files. Copyright 2013 Rick E. Schwartz. All rights reserved. Linking to this article is encouraged.